Detaining Eritreans and then beating them to force them to sign ‘voluntary’ return papers can’t mask the fact that Egypt is about to commit refoulement, the forced return of refugees to likely persecution. Instead of ripping up refugee law, ignoring UNHCR, and beating migrants and refugees, Egypt should protect them. (Geneva) – The Egyptian authorities are preparing to deport 118 detained Eritreans to Eritrea, where they risk persecution, Human Rights Watch said today. On October 29, 2011, guards at the al-Shalal prison in Aswan beat the 118 men, including 40 who already have refugee status, to force them to sign papers for their “voluntary” return to Eritrea, according to sources with access to the detainees. Egypt should stop forcing detained Eritreans to sign repatriation forms and allow the United Nations High Commissioner for Refugees (UNHCR) to interview all detained Eritreans to identify refugees among them, Human Rights Watch said. According to UNHCR, it has already registered 40 of the group as refugees in Sudan and Ethiopia. The renewed deportations signal a return to Egypt’s mass deportations of Eritreans in 2008and 2009, Human Rights Watch said. Eritrea, ruled by an extremely repressive government, requires all citizens under 50 to serve in the military indefinitely. Anyone of draft age leaving the country without permission is branded a deserter, risking five years in prison, often in inhumane conditions, as well as forced labor and torture. UNHCR considers that, in practice, the punishment for desertion or evasion is so severe and disproportionate that it constitutes persecution. Human Rights Watch spoke with multiple credible sources with regular recent access to about 160 Eritrean men and women detained for the past month in al-Shalal prison in Egypt’s southern city of Aswan. According to the sources, the detainees said that on October 26 an Eritrean embassy official visited them and asked why they had left Eritrea. He returned on October 29 with voluntary repatriation forms and told them they would all be photographed to help prepare travel documents. The detainees all refused to sign the forms. One of the sources who spoke with all of the detainees said the prison guards then beat 118 of them, mostly young men, to force them to sign the voluntary return papers, though the 30 or so women and seven children were not forced to sign. Some of the detainees told one of the sources that on November 9 an Egyptian immigration officer and an Eritrean official visited the prison with additional deportation documents, including “laissez passer” papers, indicating deportation is imminent. Ten of the men are recent deserters from Eritrea’s military. They include two senior personnel – a colonel and a person responsible for the military’s radio service – the source said. The other eight are more junior personnel, two of whom worked in food distribution services in Eritrea’s infamous Sawa military camp. The camp is the country’s main military training center and notorious for its use of torture to punish draft evaders and people trying to escape the country, as well as for its use of forced labor. Under Egypt’s 1954 memorandum of understanding with the UN refugee agency, the agency is supposed to carry out all refugee status determination in Egypt. This means Egyptian officials are obliged to give UNHCR access to all detained migrants to identify those who want to claim their right to seek asylum from persecution. In practice, Egyptian authorities often deny the UN refugee agency access to detained migrants. The Egyptian authorities have not allowed UNHCR to visit the detainees, the refugee agency told Human Rights Watch. According to credible sources, over the past two months Egyptian Interior Ministry officials have given Eritrean embassy officials access to detained Eritreans, including asylum seekers registered by UNHCR in other countries, to help prepare travel documents for deportation. Human Rights Watch said that allowing Eritrean diplomatic officials to visit detained Eritreans, including potential asylum seekers, means Egypt is violating the principle of confidentiality, essential to asylum procedures. According to reports by Egypt’s official Middle East News Agency, in October the Egyptian authorities announced that 111 Eritreans had “voluntarily” returned to their country after they had signed Eritrean embassy paperwork. Credible sources told Human Rights Watch that Eritrean Embassy officials had visited them in prison before they were deported. 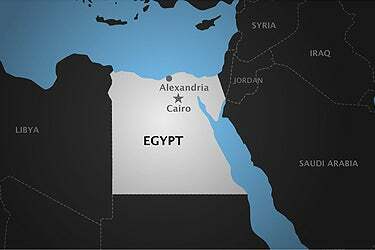 UNHCR said that the Egyptian authorities denied UNHCR access to some of the deportees, in line with Egypt’s policy of generally denying the refugee agency access to detained migrants. In the case of migrants intercepted in Egypt’s eastern Sinai region, UNHCR says the authorities argue that legitimate refugees should try to register with UNHCR in Cairo instead of crossing the Sinai desert. In June 2008, Egypt summarily returned to Eritrea up to 1,200 undocumented Eritreans who had entered Egypt from Sudan. In December 2008 and January 2009, Egypt forcibly returnedmore than 45 Eritrean asylum seekers to Eritrea. Until the reports in October, Egypt had appeared to end the deportations, except for one UNHCR-recognized Sudanese refugee, Mohammed al-Haj Abdallah, on January 25, 2010. Under the African Refugee Convention, asylum seekers have a right to seek asylum, regardless of how they enter a country or whether they have identity documents.International law forbids countries from forcibly returning asylum seekers without first allowing them to apply for asylum and considering their cases. Both the Convention against Torture and the African Refugee Convention forbid Egypt from sending individuals to countries where they face a serious risk of persecution or torture. Egypt is also a state party to the International Covenant on Civil and Political Rights (ICCPR), which, under article 13, prohibits arbitrary expulsion and entitles foreigners to an individual decision on their removal/expulsion. The UN Human Rights Committee has interpreted article 7 of the ICCPR to forbid refoulement – or forced return – of people to places where they would be at risk of torture or cruel, inhuman, or degrading treatment or punishment. Human Rights Watch said that no international agencies in Eritrea, including UNHCR, have been able to monitor the treatment of deported Eritreans once they are back in Eritrea. However, Eritrean refugees in various countries have told Human Rights Watch that Eritreans forcibly returned to their country are routinely detained and mistreated in detention.